Powdery mildews are one of the most common diseases of ornamental plants; many nursery, flower, vegetables, and woody plants are susceptible. Greenhouse crops prone to infection include African violet, Begonia , Dahlia , gerbera daisy, Hydrangea , roses, Verbena, Kalanchoe, and Poinsettia. Herbaceous perennials particularly susceptible to Powdery mildew include Aster, Centaurea, Coreopsis, Delphinium, Monarda, Phlox, Rudebeckia, and Sedum. The disease is easily recognizable as a white to gray powdery growth on leaves and sometimes stems and flowers. Powdery mildew may have little or no affect on the plant (other than aesthetic) or it may cause infected leaves to distort, discolor, wither, and defoliate prematurely. 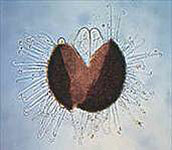 Most Powdery mildews have evolved to avoid killing their hosts because they can only survive in living plant tissue. Symptoms and their severity depend upon the cultivar or species of host plant, the powdery mildew species, environmental conditions, and the age of plant tissue when it first became infected. Sedum develops brown scabby spots that can be mistaken for a leaf spot diasease or spray injury. Powdery mildew diseases are caused by species of fungi such as Erisyphe, Leveillula, Microsphaera, Podosphaera, Odium, and Sphaerotheca, although each powdery mildew is specialized to infect only hosts in one genus or one family. Infection does not spread to species of plants in other plant families. Erisyphe has a wide host range and can infect many plants in the Asteraceae family, while Sphaerotheca pannosa var. rosae is confined to roses. Podosphaera xanthii infects Calibrachoa, Verbena, petunia and also infects cucurbits (pumpkins, squash, melon and cucumber), so it is important to avoid growing squash and cucumber transplants in the same greenhouse as susceptible verbena or calibrachoa. The distinctive whitish powder on leaves is composed of fine threads of fungal vegetative tissue (mycelium) and light colored mats of asexual spores (conidia). 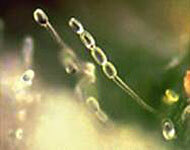 Some Powdery mildews produce conidia on short, erect branches that resemble tiny chains, while others form threads so sparse that the mildew cannot be seen without the aid of a microscope. These spores are easily moved by air movement and water splash. Because Powdery mildews are obligate parasites, they do not require plant stress or injury to infect plants. When spores land upon a susceptible host, they germinate and send a specialized feeding structure into the epidermis and obtain their nutrients from the plants. The infection process may take as little as 3 days or as long as 7 days. The pathogen survives in the greenhouse in weed hosts or on crops. Outside, the pathogen can overwinter as mycelium in infected plant parts or in resting structures (cleistothecia) produced by sexual means and visible as small, dark specks on dying leaves. Powdery mildews, unlike most other fungal diseases, do not need free water to germinate and infect. They are favored by high relative humidity (greater than 95%), moderate temperatures (68°-86° F), and low light intensities. These diseases are more prevalent in the spring and fall when large differences between day and night temperatures occur. Temperatures above 90° F kill some Powdery mildew fungi and spores and the presence of free water can reduce spore germination. 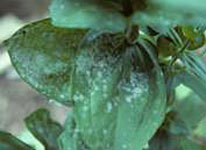 Monitor crops on a regular basis for Powdery mildew diseases. Epidemics that seem to develop overnight are often the result of undetected low level infections that have spread spores throughout the greenhouse. Rogue infected plants or prune out diseased tissue. Perform this operation when plants are wet or immediately place diseased material into a plastic bag to prevent spores from spreading. The use of resistant cultivars or species is a good management tactic. Although few ornamental crops have been bred for resistance, cultivars of African violet, Begonia, rose, pansy, Zinnia, Monarda, and Phlox with resistance are available. Avoid overcrowding of plants and provide good air movement. Keep relative humidity levels low in the greenhouse by a combination of heating and venting in late afternoon and early morning. Clean greenhouse thoroughly between crops, eliminating all weed hosts and volunteer plants. Unlike most fungi, powdery mildews only colonize the surface of plants making chemical eradication possible. It is not necessary to use fungicides to prevent Powdery mildews. Fungicides with the active ingredients azoxystrobin (Heritage), propiconazole (Banner Maxx), pyraclostrobin (Insignia), myclobutanil (Eagle, Systhane), triadimefon (Bayleton, Strike), trifloxystrobin (Compass), thiophanate methyl (Cleary's 3336), potassium bicarbonate (Armicarb, MilStop), or sulfur are registered for Powdery mildew control on ornamentals. Sulfur may cause plant injury if applied when temperatures are high (greater than 85° F). Because the genera and species of fungi causing Powdery mildews are diverse, there may be some variation in fungicide effectiveness across crops. The Powdery mildew fungi can develop resistance to any of the fungicides, except sulfur, listed above so be sure to alternate fungicide applications among chemical classes. Disease Resistant Annuals and Perennials in the Landscape. Purdue University, 2009. Powdery Mildew Cross Listing, Penn State Extension, A cross listing of host plants susceptible to powdery mildew. Integrated Management for Floriculture and Nurseries. 2001. University of California Integrated Pest Management Project. Publication 3402. New England Greenhouse Floriculture Guide. New England Floriculture, Inc.
Pundt, L. Powdery Mildews in the Greenhouse. Warfield, Colleen. Squashing Powdery Mildew in Calibrachoa. Grower Talks July 2011.